Grady is very much a velcro dog. Chasing him down will NOT be an issue! He is polite and friendly. He too loves to play with other dogs. Grady has the potential to make an excellent service dog. He has incredible focus on his humans. He is on the small side, but he may not be fully grown yet. He is in the 30 – 40 pound range. He has one green and one blue eye; a spirit dog! You can see more photos and updates of Grady on his Facebook page. 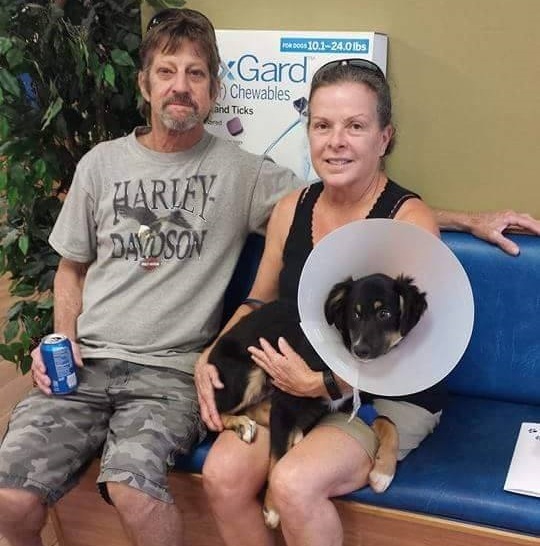 Mr. Grady was adopted by Danielle and Jaimy of Deland! Lady Cordon Bleu (formerly Maggie) is a approx. 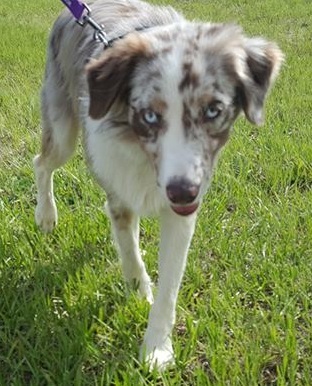 2 1/2 years old Australian shepherd. She weighs 55 lbs. 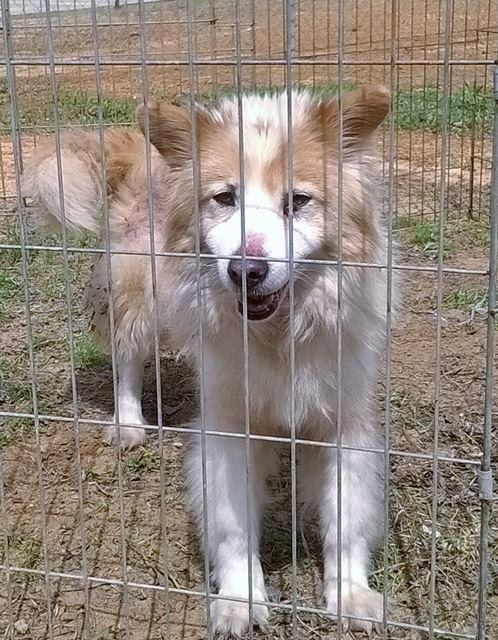 This stunning girl was an owner surrender to a shelter in AL, who just came to TDL. She’s a wonderful dog, BUT she thinks chickens taste great with ketchup, which makes her a not-so-good farm doggie. She definitely needs a home without chickens, cats, or other small animals! More information and photos coming soon.In the meantime, check out her photos on Facebook! 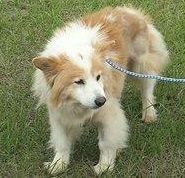 Maggie is located in Deltona, FL. 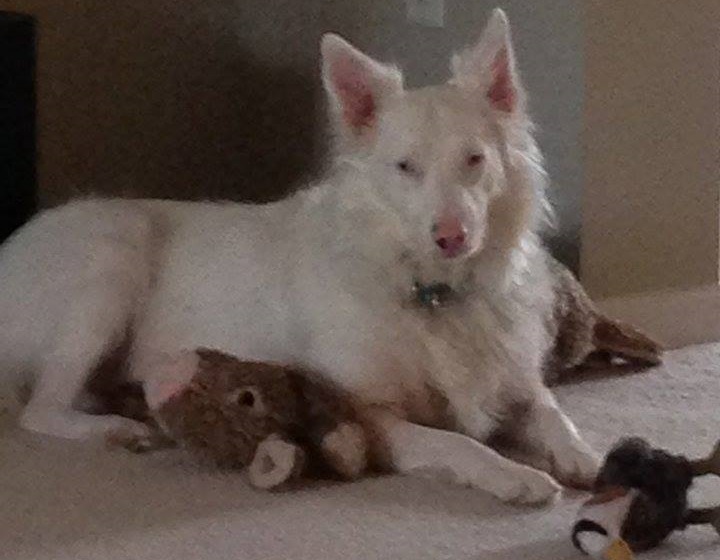 If you’d like to meet Maggie, please go here first to learn about our adoption process. 03/15/17 Update from Serena: Deja Bleu, What can I say, I fell in love with her! As I tended to this creature who had such a beautiful soul, I contemplated for quite some time if I should keep her or not. I’ve been helping Giselle with TDL for over 4 years now and I haven’t been in the position to adopt until recently. I thought it would be a great present to myself to adopt Bleu and become a forever Mom to a TDL dog. I’d give Gisele all the excuses in the world as to why Bleu had to stay with us, and even went through some great lengths to keep her hidden from adopters so she could be by my side. I had decided, Bleu was mine. She a spectacular dog! She’s slightly stubborn when it comes to who gets to sleep in the middle of the bed, but the perfect snuggle buddy once we both would get settled in. When I move, she moves. Even to go get a glass of water, she accompanies me to the kitchen and back. She blends in perfect with the pack and tends to follow Bernie’s lead when roaming around outside. Bernie is my Sheltie of 8 years! When Bernie barks, Bleu barks, as if responding to his rants. When Bernie runs, Bleu chases him as far as Bernie’s legs will go. She loves to chase! Bernie chases the tennis balls and Bleu chases Bernie. Living in the life of rescue though, I know through experience, things don’t always work out as planned. With Bleu being so perfect, I always thought she could serve a greater purpose. She would be a great service dog, or therapy dog. She has that gentle temperament but playful personality and it’s a perfect blend to be approachable to any person. Although she prefers to stick by me, she is always welcoming to anyone she met. Dog or human. It wasn’t long before a family came along that needed a dog like Bleu, and it was all by chance. I have a day job working at a Call center, I have a team of people I enjoy working with on a daily basis and they all knew I was excited about this new dog. While having open discussions about dogs and who has had what breed and such, it came to my attention that one of my colleagues, Sarah, has been wanting a dog for some time, but hasn’t been able to take the next step because her youngest son Alden has a fear of dogs. “HOW AWFUL! !” this is all I could think to myself! I love dogs, and dogs are my life! How can a human be deprived of “Man’s Best Friend”? When I inquired further, Sarah explained that he had sensory issues. His little brain is easily overloaded with environmental stimuli. This makes it hard for Alden to determine if the gaze of a dog has malicious intent or not. Whereas you and I might be able to determine within seconds, what intentions a new dog has when being introduced to a pack. Because of this, he developed a natural fear of dogs. After hearing all of this, I immediately thought of Bleu. I didn’t say it right away but I knew… I knew Bleu would be perfect for Sarah and her Family. Just like any other dog Bleu gets excited when stimulated, but in general, Bleu was a very gentle and quiet dog. I went home to Bleu that night a snuggled her close. I reminded myself why I am in Rescue, It’s not just about the dogs. It’s also about the people who feel complete once they take home a TDL dog. That feeling of completeness when you expand your family. I knew I had to let Sarah know I had a dog that could potentially help Alden get over his fears, and let her family get the dog they have always wanted. I went to work the next day and shared my thoughts with Sarah. At first, she was a little unsure. Having tried several times before to introduce Alden to dogs had not been successful as of yet. She asked for some time to consider and I told her to take all the time she needs. If the situation didn’t work out, I would absolutely take Bleu as my own. After lots of thought and discussions with her husband Aaron and the family, Sarah decided it was time to introduce Alden, and her older son Taylor, to Bleu and see how well they got along. We choose a local community park to meet at. Her older son Taylor was beyond excited, he told me he has been begging for a dog for years! After some standoffish hellos from Alden, he was able to reach out and pet Bleu. After a few more moments my heart swelled with pride as I passed along Bleu’s leash to Taylor and his younger brother Alden who immediately told us he was scared of all dogs… except Bleu. Bleu gave him hope and confidence! They both asked lots of questions about Bleu. They wanted to know everything about her. How much to feed her, what her favorite food was, what toys she preferred. The questions were endless and I was happy to answer them all. After a walk down the nature trail and some practice teaching the boys some basic training habits, we went to the baseball field for a run! I ran with the boys and Bleu, several laps around the bases and we were all exhausted! Sarah’s Husband Aaron was able to catch us at the end of the play date and get a quick introduction to Bleu himself! All and all it was a great meet! Although the decision had not been made, I knew by instinct this was a match. 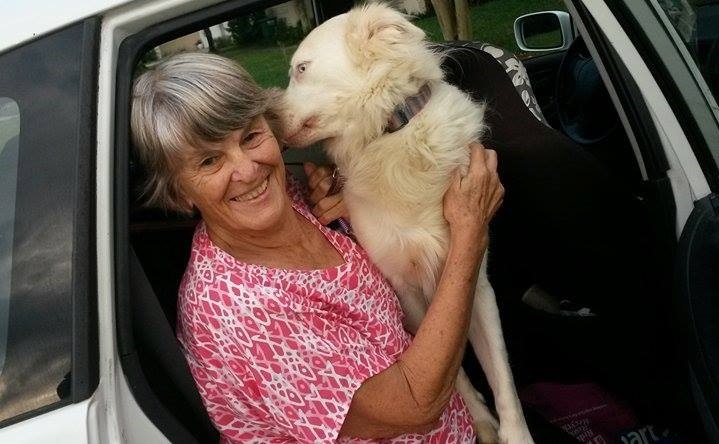 Sarah wanted to allow some time to pass, ensure this is the dog the family wanted. After a week, it was decided. They couldn’t stop talking about Bleu. They couldn’t stop reminiscing about the fun they had at the park! I was thrilled. We agreed we wouldn’t rush it and wanted to meet a few more times to allow both Bleu and Alden time to adjust. Every day Sarah and I would swap stories. I would tell her about all of Bleu’s little quirks and habits. She would tell me how excited her boys were and how her husband was convinced Bleu would prefer him over anyone else. As the days past the excitement grew. Taylor has written stories and generated care plans for their first week together! Alden and Sarah have gathered all the necessities of owning a dog. Toys, bowls, crate, food, treats, new leash and collar, more toys! When all is said and done, Sarah and Aaron, along with their boys Taylor and Alden, now have a brand new member of the family! Aaron is a pastor at Heart of Christ Christian Church in Orange City. Their family is very large and extensive. Bleu will be accepted with open arms to a whole new world full of love and happiness! We couldn’t be more thrilled that Bleu will get to be with a family who didn’t think they would have the chance to experience life with a dog! We know that Bleu has forever changed the lives of these boys by adding to the ultimate joy of life! Unconditional love! She will have more friends and family she ever believe possible, and she will get all the attention she deserves! 03/30/17 Update from Serena: Wow! 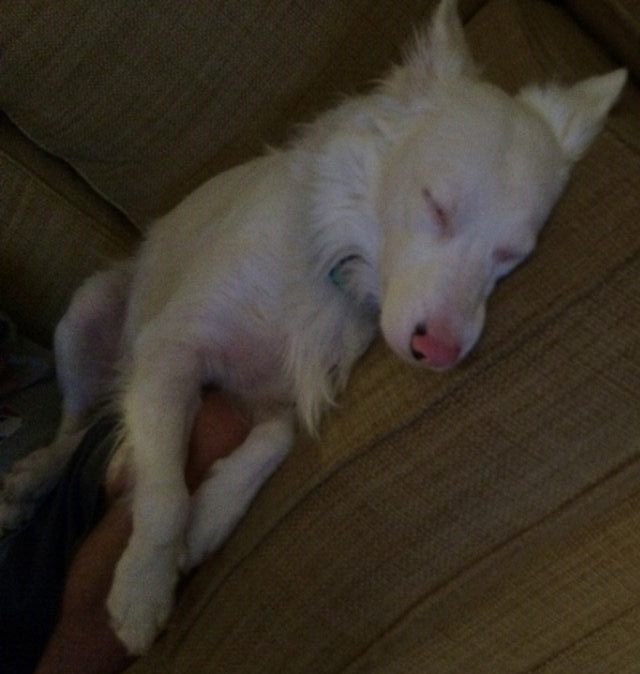 Bleu has settled right in with her new family and is bonkers about her boys! She is protective and proud to have them. She’s even helping to keep them in line! She has already ratted Alden out for trying to sneak out of bed. HA! Alden himself has really become quite fond of having a new cuddle buddy. Bleu quickly discovered all the yards with chickens while adventuring out in her new neighborhood during her walks with the family! 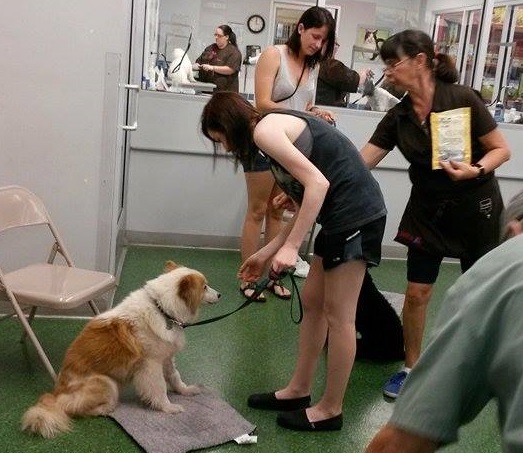 The family came out to our annual reunion recently and Taylor got the biggest dose of doggie love yet! Bleu ran her little heart out! Over and over and over again! Bleu loved being able to see her loving pack so soon and was quite happy showing off her new Family! These are the moments we live for! 12/18/16 Update: Graham has been very patient, and it paid off! 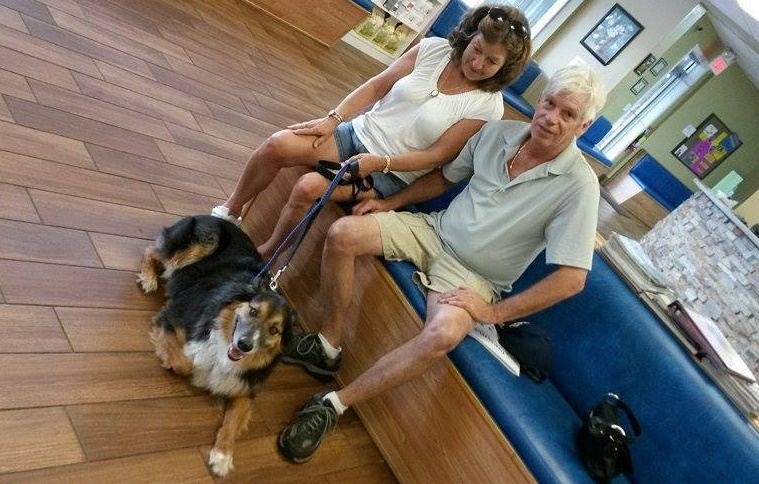 Today he found his home with Bill and Pam Kiefer of Port Orange, Florida! 10/14/2016 Update: Handsome Graham is back with us. Unfortunately, his owner is moving and is unable to take him along. Graham is a very sweet and happy guy who does well with people and other dogs. He does like to chase the little critters, though, so a home without cats that has a fenced yard would be best. Graham’s Boo Boo is all better! Meet Golden Graham! He was named for his gorgeous coloring and the fact that he was our first rescue that was initiated on Instagram. I’ve been calling him Graham and it seems to suit him well. 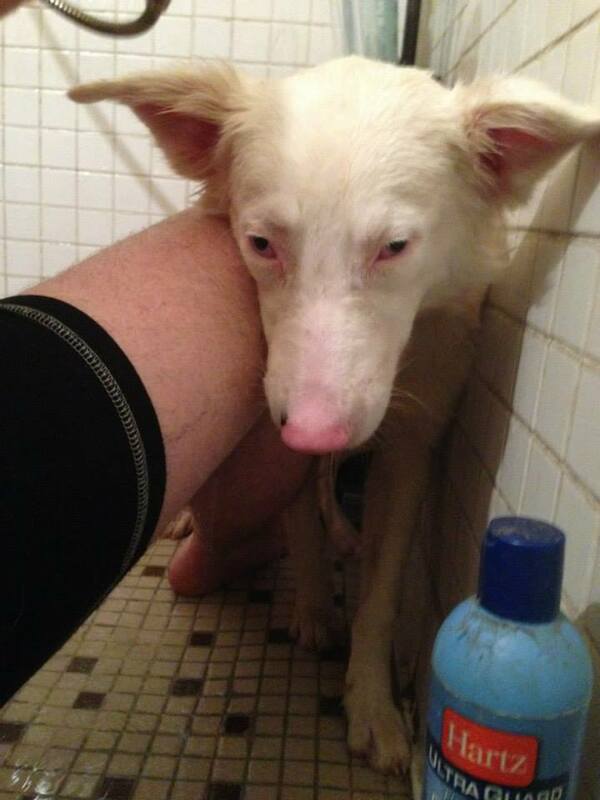 Graham was rescued from Miami-Dade Animal Services where he was picked up as a stray. A big thanks to Jeanette and Patty Duenas for helping us to rescue this doll. He is about 7 months old. Right now he weighs 35 pounds but we expect him to fill out and grow to probably around 50 pounds or so. He’s a little on the thin side right now but I’m working on fattening him up a bit! He is super sweet and affectionate. Graham loves to be pet and will beg for more and is also very gentle when taking treats from my hand. He gets along great with my dog and hasn’t bothered with our cats too much. He let me know when he had to go potty last night and hasn’t had any accidents in the house since we’ve had him. He has typical puppy energy and really enjoys running around the yard and playing with our dog. He was found with a flea color embedded in his skin. 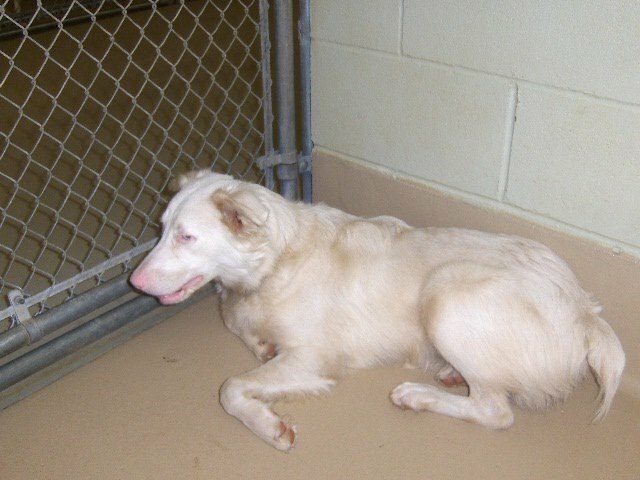 The shelter had it removed and he has a sore around his neck that is healing. It doesn’t bother him one bit though! It’s starting to scab up and he’s on antibiotics for a week. Click the link to see more photos of Graham on Facebook. Graham has been with us for a week now and is a real sweet boy. He loves to run and play with our dog and then will sleep somewhere near wherever his human is. He seems to be very happy and is always wagging his tail. He loves playing with all of the dog toys and I’ve even caught him with two in his mouth at once so proud of himself. He hasn’t had any accidents in the house. I haven’t had him out for a walk yet so I’m not sure how he does on a leash. I gave him a bath last week and he wasn’t too thrilled but could tell he felt much better afterwards. His neck that was scabbed over from an imbedded flea collar is almost completely healed. Graham will be a wonderful addition to his new family. Graham was transported to me in Deltona so Michelle could attend a Disney event! Woo Hoo! He is amazing. His boo boo on his neck is healing nicely. I thought he would enjoy a spa day at Newman’s via James! Graham is all puppy and loves to play. He is incredibly affectionate and great with dogs, kids and cats! What more could you for? 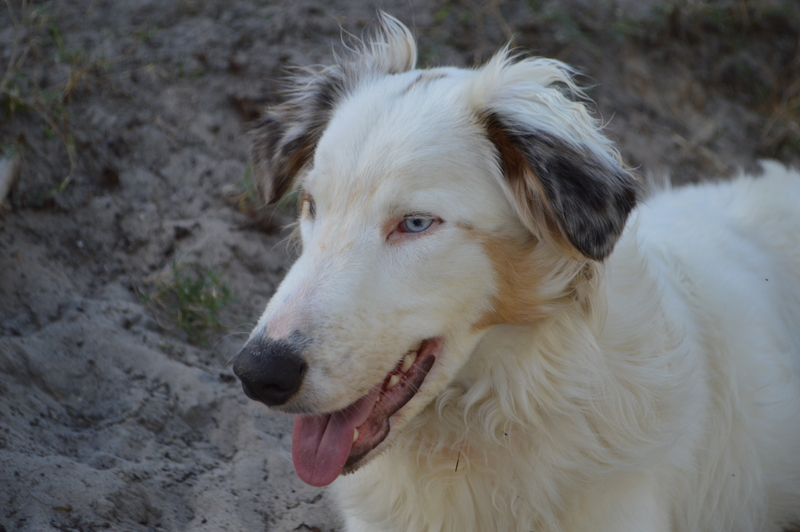 Graham the Collie moves to Barefoot Bay! 09/09/14 Update: Scott adopted Graham today! 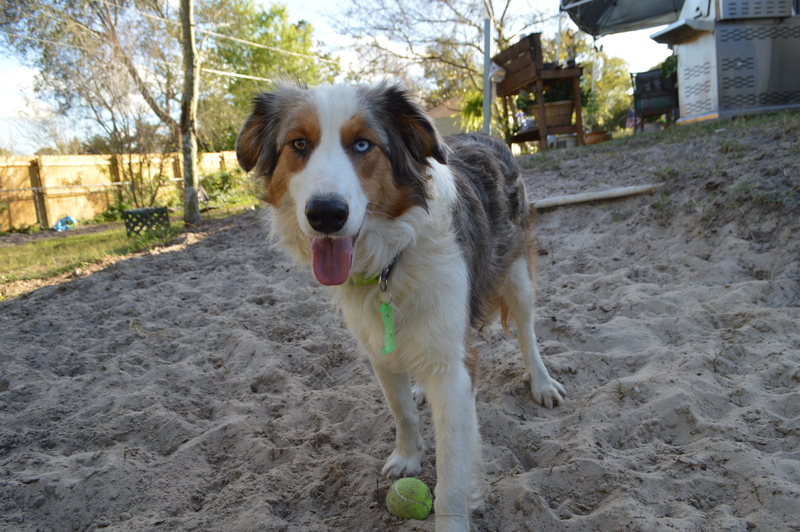 Scott lives in Barefoot Bay, FL and his collie mix died several months ago. Scott told me, “I’m ready!” Scott’s Mom came to meet Graham as well, and she gave him her stamp of approval – but not until the sand hill cranes in my front yard put on a show and danced for about 10 minutes! Can’t wait for Graham updates! Introduction Davos! This little guy is so friendly and sweet. He will follow you around everywhere, and is always looking for pats and hugs. We just love him! We will be posting updates to this album as we get to know him better. As far as what breeds he is, your guess is as good as ours. We see Cattle Dog, Aussie, Hound, and maybe some Corgi? All we know for sure is that he’s stink’n cute! Davos weighs approx. 12 lbs, and is around 9 weeks old. If you’d like to be considered for Davos, please go here to learn all about Our Adoption Process. We don’t use a traditional application, but we would like you to answer a few questions so we can get to know you better. 8/16/2016 Update: Davos has set sail with the Workman family of St. Cloud Florida! Congratulations to them all! 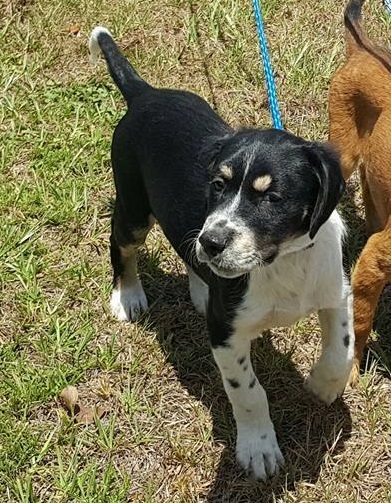 Lady Lyanna Mormont ~ Adopted! What can we say about Lyanna? She’s quite a bit smaller than her two brothers, but she’s definitely in charge! She’s a girl who knows her own mind. Bright, playful, and alert. Please keep your eye on this album for updates and more photos. As far as what breeds she is, your guess is as good as ours. We see Cattle Dog, Aussie, Hound, and maybe some Corgi? All we know for sure is that she’s stink’n cute! Lyanna weighs approx. 10 lbs, and is around 9 weeks old. 8/8/2016 Update: Lady Layanna Mormont found her home today. 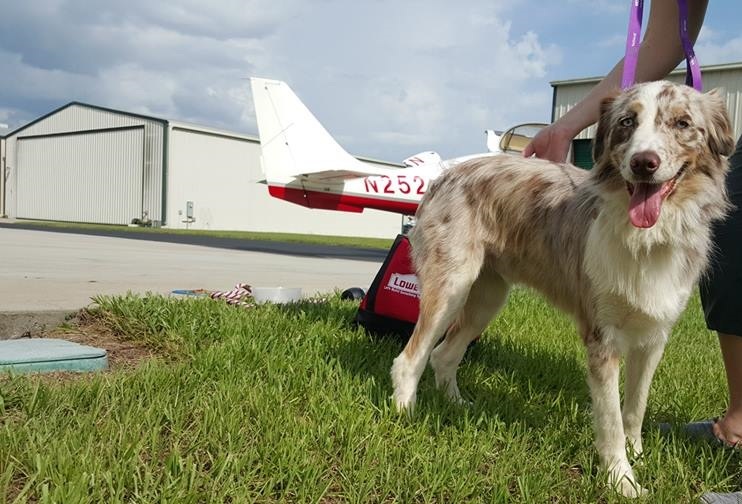 She will be joining Casey Stains of Melbourne FL and her family which includes two children, three dogs and her partner Mike! Sounds like this little Lady is going to have quite the kingdom! 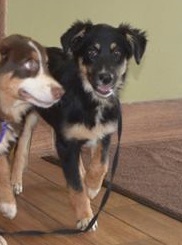 Lord Beric Dondarrion ~ Adopted! Say hello to Beric! He was born with only one eye, bit it’s not getting him down in the slightest. 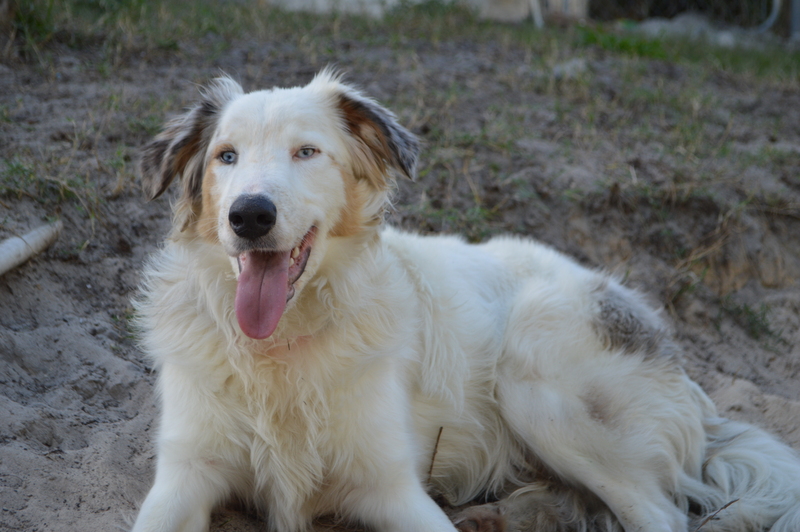 He’s a very happy and affectionate boy, and would make a great family dog. We will update this album as we get to know him better! Beric weighs approx. 12 lbs, and is around 9 weeks old. If you’d like to be considered for Beric, please go here to learn all about Our Adoption Process. We don’t use a traditional application, but we would like you to answer a few questions so we can get to know you better. 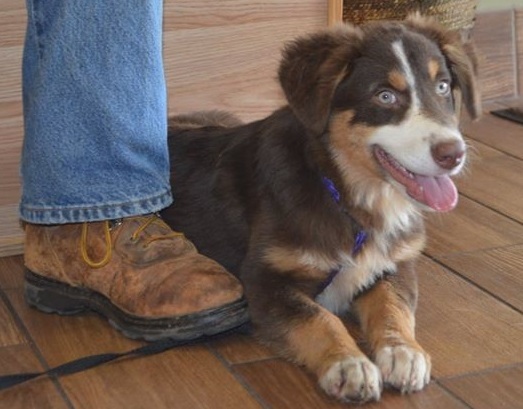 Amber is an Aussie Puppy. 9/14/15 Update: The sisters have left the building! Lori Taylor and her husband adopted Amber today! 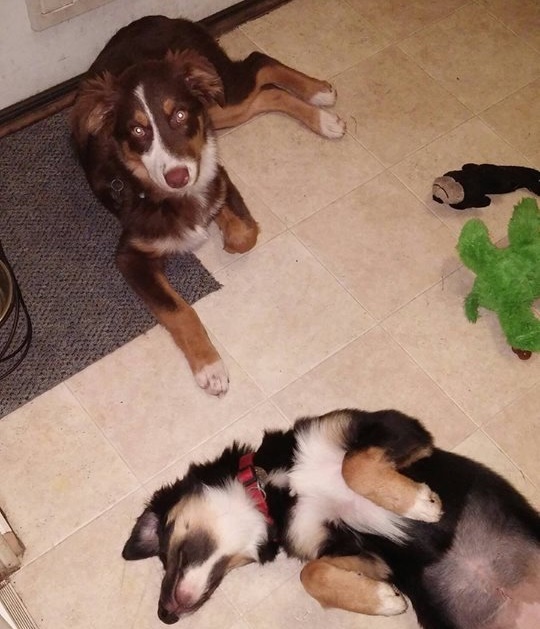 9/24/15 Update: Amber got a surprise today, Her sister Kimberly came to stay! The Taylors adopted them both! 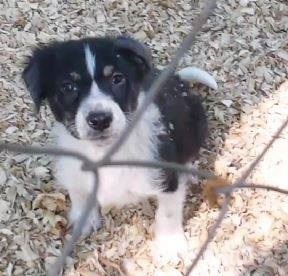 Kimberly is a young Aussie Puppy. 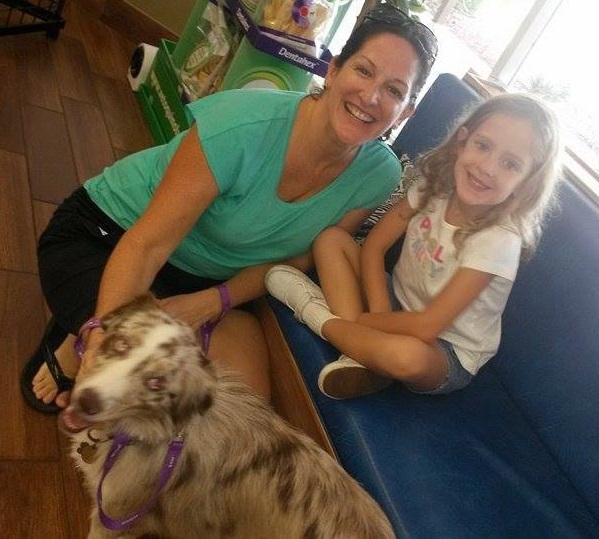 9/24/15 Update: Kimberly was adopted by the Taylors! They preveiously adopted Amber, her sister, and were fostering Kimberly. Not surprisingly, they experienced “foster failure”. Yay Kimberly and Amber!!! Jake from State Farm! ~ Adopted! Say hello to Jake from State Farm (we’re calling his that, because it looks like he’s wearing a pair of khaki pants!). 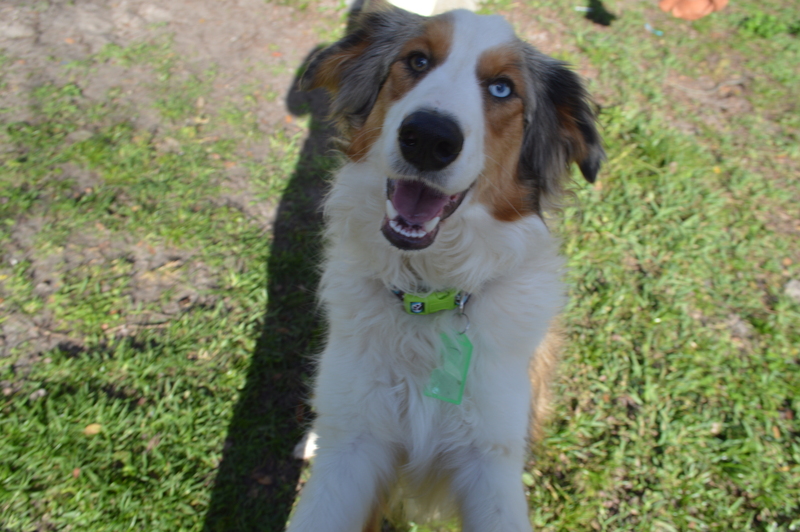 Jake’s a lovely 17 month old purebred Aussie who weighs in at around 30 pounds. This wonderful boy is very friendly and well-behaved. He’s fully trained, sits on a dime, loves to play with a tennis ball, likes other dogs, and doesn’t care at all about chasing cats. He’s one of those “just add water and stir” dogs. We think he would be perfect for a family with kids. All around easy peasy! If you love cuddles you will love me. He has already had his “beauty bath” (groomed) and has no matting, no fleas, stunning teeth… He could be a model. 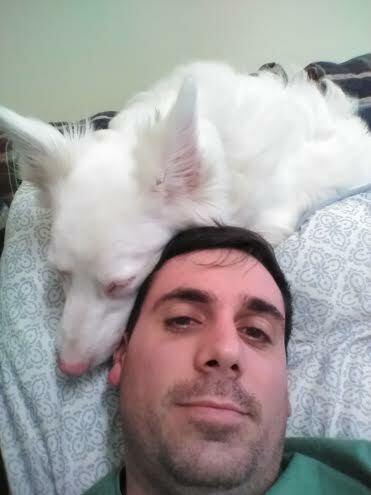 Loves to cuddle and doesn’t jump up. Want to see more of Jake? Check out his Photos on Facebook! 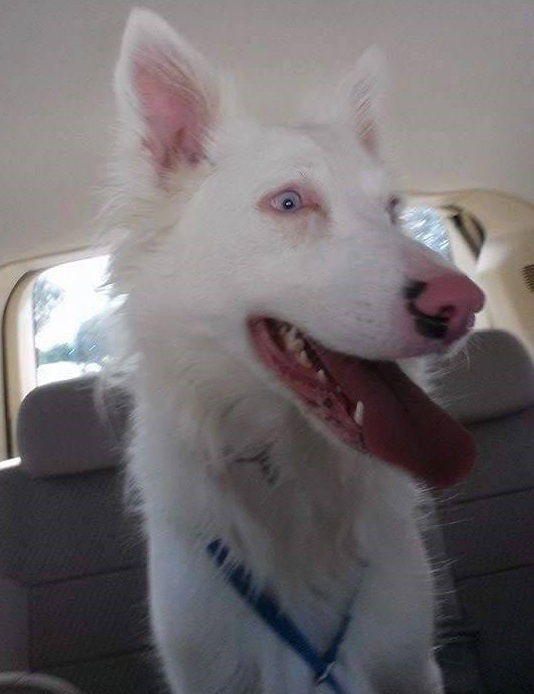 Jake is located in Deltona, FL. Awesome family dog… kids a plus! 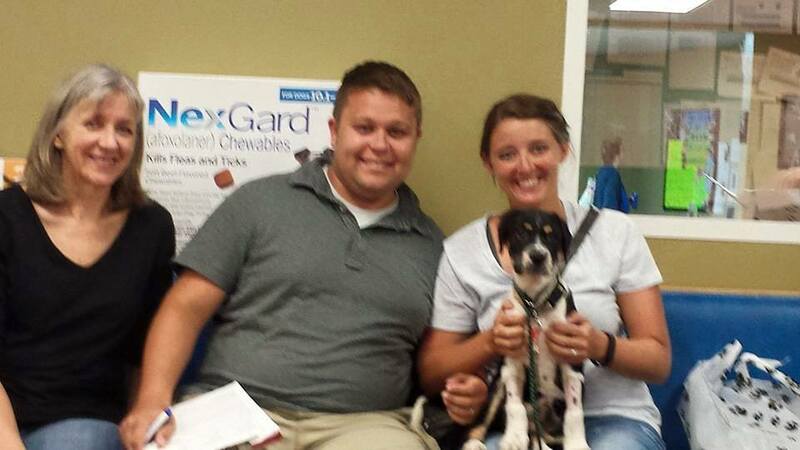 7/14/15 Update: Jake was adopted by Karen, Brad, and their daughter, Faith, today! He will be living in lovely Baldwin Park, just minutes from the dog park. 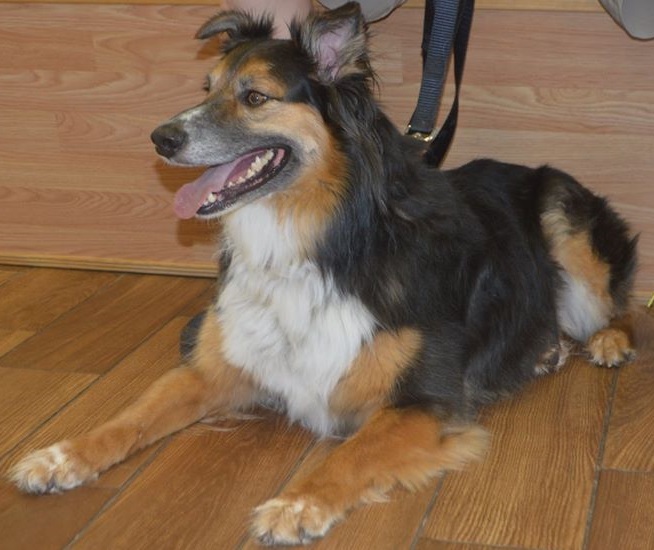 Congrats on finding a great forever home, Jake! Lenny – The fluffy little boy! ~ Adopted! 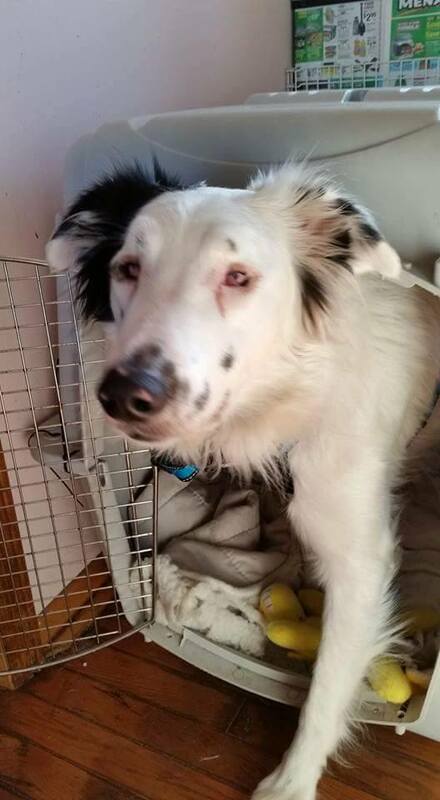 Lenny is being transported to us on the 30th, along with his sister, Libby. 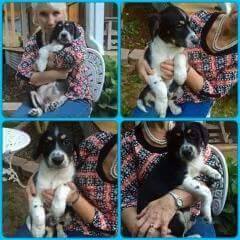 We don’t know a whole lot about him yet, but we believe that he’s around 12 weeks old, and that he’s an Aussie/Collie/Spaniel mix. 6/1/15 Update! Lenny was adopted by Daniella and Mark tonight. Congrats on your wonderful new puppy, guys! 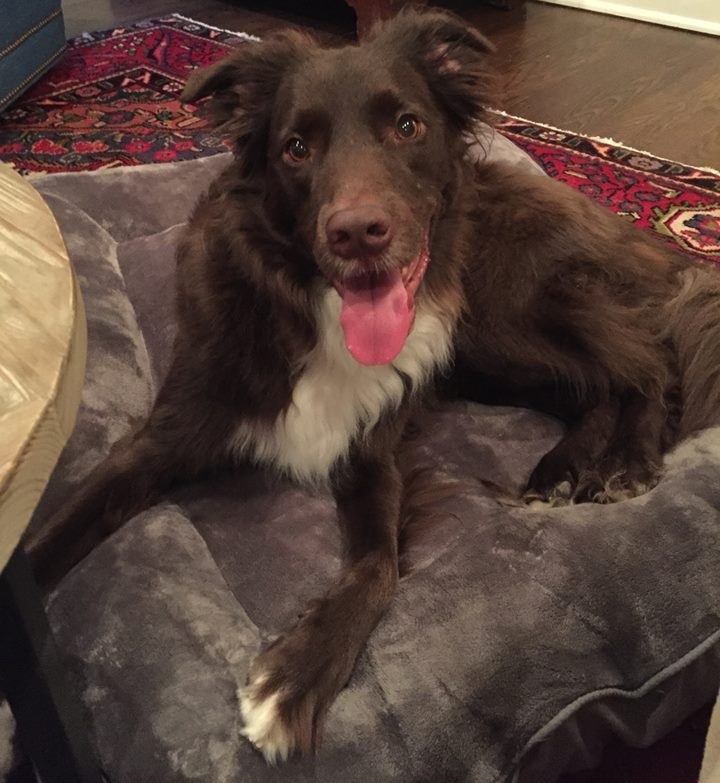 Luna Belle is about 6 years old and is an Aussie mix out of Alabama. 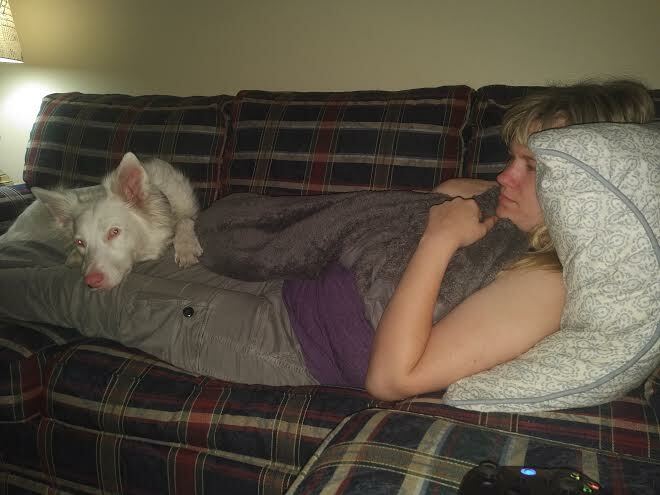 She joined TDL in April but has been recovering with TDL Volunteer Rachel until she was ready for adoption. Luna comes to us from a hoarding situation. She lived with many other animals, was underweight, and had lost fur due to a flea allergy. Luckily with a little TLC her fur is back and she has put on a few pounds. She was also heartworm positive but has already undergone treatment and from here she has a few antibiotics and her regular preventatives (no other special measures). She will continue to test light positive for heartworm for a while longer, but that should fade soon. Luna is an awesome girl. She is house broken, crate trained, good on a leash, very polite (no jumping up from this girl) and is not an “over-barker”. She may give a woof if she sees something very strange but the average things of life (cars, mailman etc) don’t really phase her. She has 2 more classes at Petco and then she will get her first obedience certificate (Yey Luna!!!). Luna would do best as an only dog, not because she has any issue with other dogs, but because she came from a home where she had to share her life with lots of other dogs and she would really like to retire and be someone’s best girl. 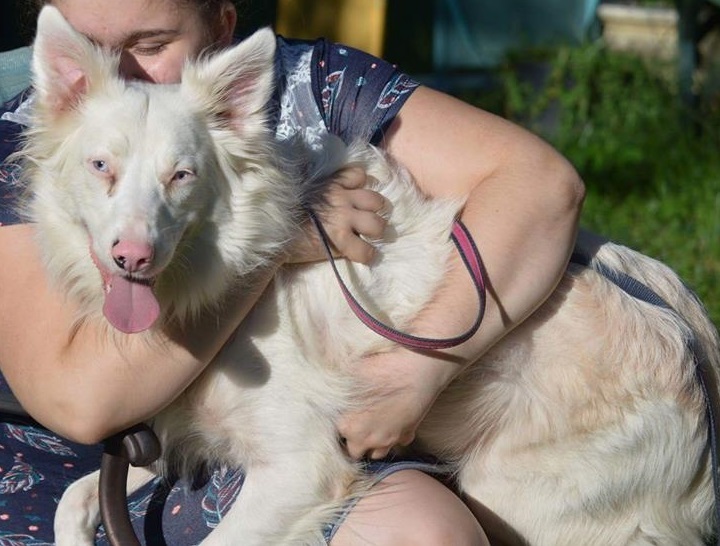 She would be a great first-dog for someone new to dog ownership or maybe an older family because she is generally calm, quiet and easy (just add water and stir) but really she could be great in any home. She is not really the kind of dog who wants to go to the dog park but would love to be someone’s walking buddy (again, good on a leash!). Luna isn’t clingy. She is happy to be with you, but if you need to run some errands she isn’t one to freak out about it. This sweet girl seems to understand that you’ll be back and is content to wait until you come back for her. She just seems to understand, and waits for you to come home and pat her on the head. 5/17/15 Update: We are so proud of Luna! 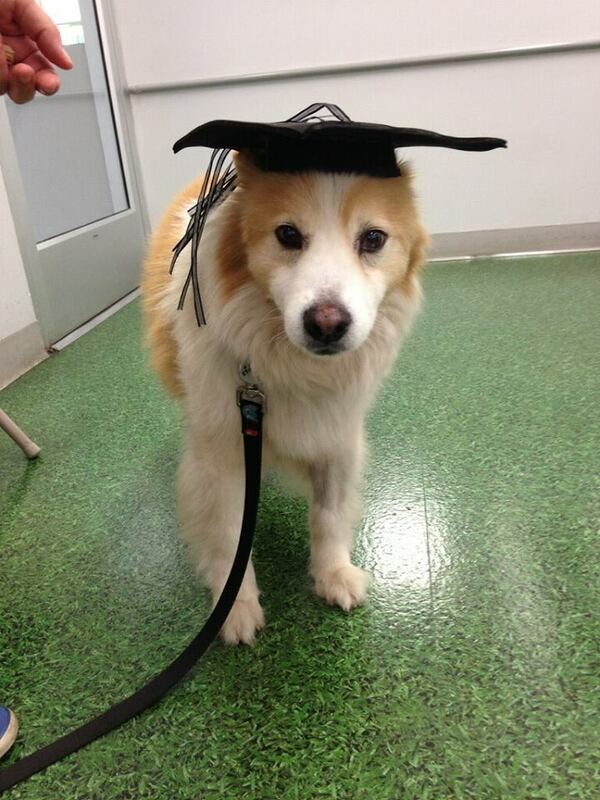 Yesterday she graduated from her obedience classes! 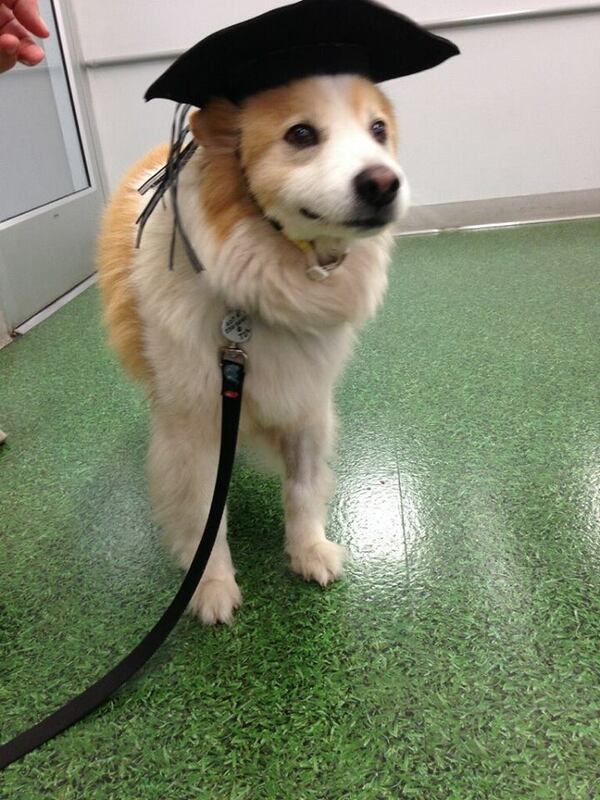 Here she is in her mortarboard, standing proud. We couldn’t be more pleased! 5/30/15 Update! 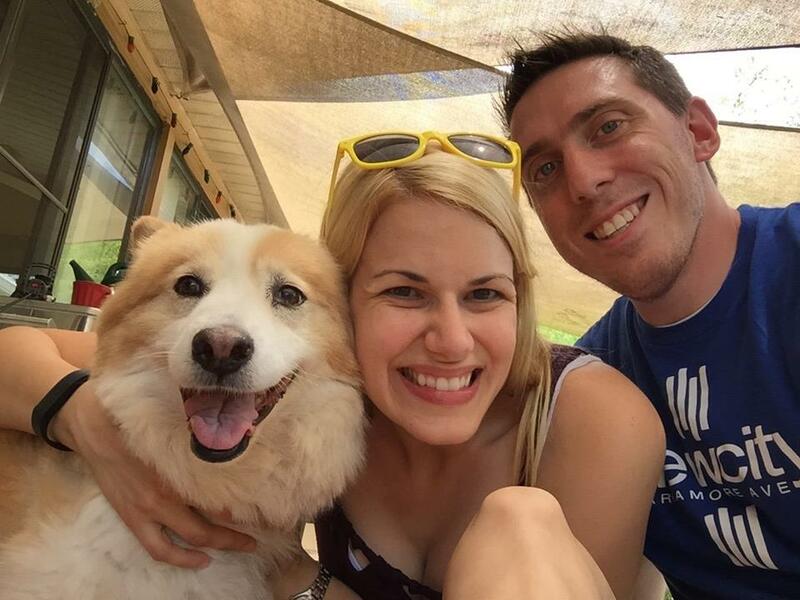 Luna was adopted by Zach and Julie of Orlando today! They already seem to have hit it off and we are so happy for them. Congratulations to all! More updates to come! In the meantime check out her photos on Facebook.